Yellowcake is getting lots of advance love in the US (it's due out there mid-May). So far it has two starred reviews. Haunting, gorgeous, and sometimes painful, Lanagan’s stories are unlike anything else in fantasy literature. Lanagan unravels familiar myths and fairy tales, weaving them into unique, sharply resonant forms in this characteristically stunning collection. Reading Lanagan, like learning a language by total immersion, involves a leap of faith. Each tale conjures a world with unique laws and lawbreakers. Rather than being coddled by comforting dollops of exposition, readers dive into the murky unknown. Spellbound, they reach the end, astonished at how far from shore they’ve traveled ... Familiar roots and accessible themes make this strong collection a good introduction to Lanagan’s mind-bending work. ...But in all of Lanagan’s worlds, the familiar becomes unfamiliar and then wondrous. Each story is tightly crafted, dropping readers into a culture without much preface, letting the events spin out and the characters be forever changed, and leaving those turning the pages haunted afterward. Less-sophisticated readers might be frustrated by the density of these selections and their focus on character rather than plot, but for those willing to invest, the payoff is powerful. This is meaty fare, layered with meaning and thick with a richness of imagination. 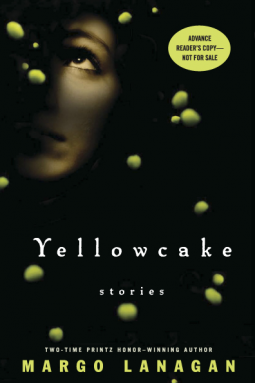 Yellowcake is as much about the telling as it is about the tales.